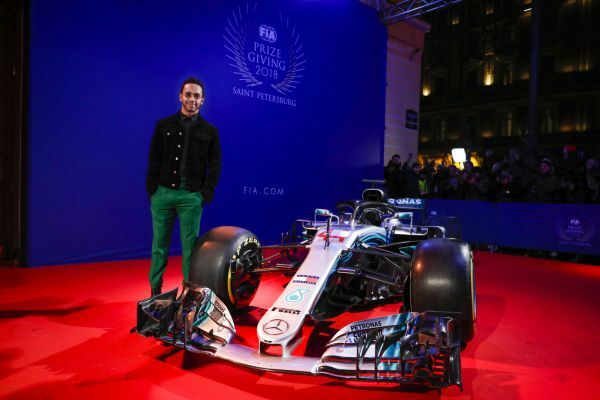 08.12.2018: F1: FIA Prize Giving Gala After an exciting and challenging Formula One season, Mercedes-AMG Petronas Motorsport was yesterday awarded the trophies that represent the culmination of a season of endeavour, commitment and tenacity. 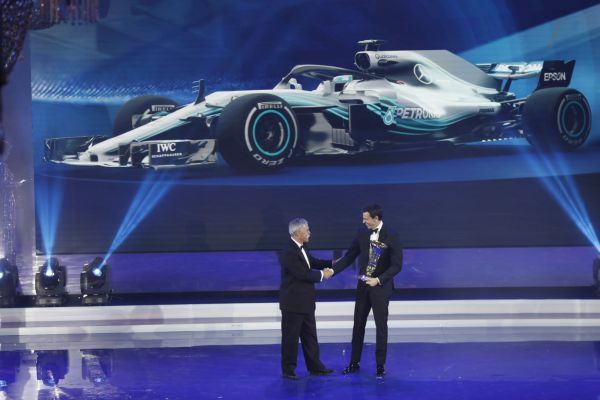 After an exciting and challenging Formula One season, Mercedes-AMG Petronas Motorsport was yesterday awarded the trophies that represent the culmination of a season of endeavour, commitment and tenacity. 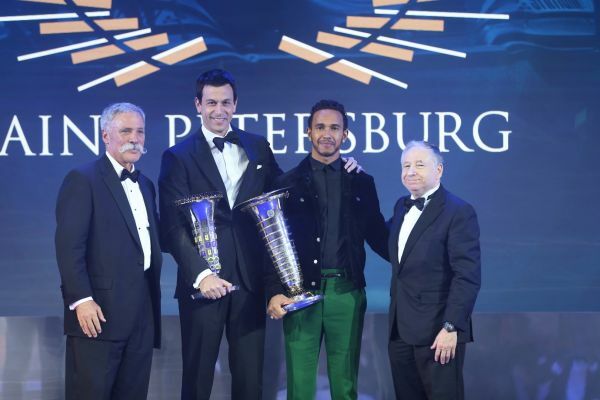 Toto Wolff received the fifth consecutive FIA Formula One Constructors' Championship trophy on behalf of the team, and Lewis was awarded his fifth Drivers' Championship trophy at the FIA Prize Giving Gala in St. Petersburg, Russia. The team went up against some formidable opponents this season and it proved to be a tough fight. The intensity of this year's battle is also reflected in the stats of the 2018 F1 season. The team claimed 11 wins from 21 races and scored 13 pole positions, leading 542 of 1,264 laps. When you combine all of the laps racked up through pre-season and in-season tests, practice, qualifying and the races, our two Silver Arrows completed 7,791 laps. Mercedes-Benz power ran 21,983 laps in total; combined, the six cars scored 714 points, 26 podiums and 23 front row places. 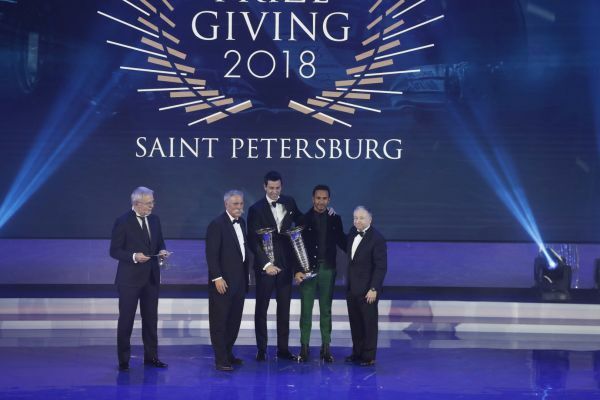 Held in St. Petersburg's historic Philharmonia, the 2018 FIA Prize Giving Gala recognised the achievements of many different teams and drivers in all of the FIA-regulated racing series. For the fifth consecutive time, the FIA Formula One World Constructors' Championship was awarded to Mercedes-AMG Petronas Motorsport. Lewis also received Drivers' Championship trophy number five; four of which he won with Mercedes-AMG Petronas Motorsport and all of them with Mercedes-Benz power. "This has been our most challenging season so far and put all of us to the test," Toto said. "We all had to raise our game, each and every member of our team. The fact that we ended up winning both titles is a testament to the incredibly hard work of the entire team. I am very proud of this accomplishment and I feel honoured to receive this trophy on behalf of everyone in Brixworth, Brackley and Stuttgart who helped to win these Championships." "One of the great things about the FIA Prize Giving Gala is that the event brings together so many different motorsport Champions. Huge congratulations to everyone who fought hard to receive a championship trophy tonight - well done!" The FIA Prize Giving Gala also recognised the achievements of George Russell and Mick Schumacher in F2 and F3 respectively. After securing the title in Abu Dhabi in late-November, George was awarded the FIA Formula 2 Drivers' Championship trophy in St. Petersburg. Mick, who had clinched the title in mid-October in Hockenheim, received the FIA Formula 3 European Drivers' Championship trophy. The President's Award was won by Niki Lauda and Toto Wolff for their contribution to the fifth consecutive Constructors' Championship. Mercedes-AMG Petronas Motorsport is only the second team in the history of Formula One to win five consecutive double titles. These awards crowned one of the most successful years in the motorsport history of Mercedes-Benz. The brand won each possible title in Formula 1, DTM, Formula 2, Formula 3 and F1 eSports, as well as enjoying its most successful ever year in customer motorsport with more than 130 wins and over 40 titles, including the first ever FIA GT Nations Cup.